Dorm Dilemmas - Family Times is an award-winning magazine with staff-written news, feature stories and artwork that inform and inspire Central New York parents and their children. 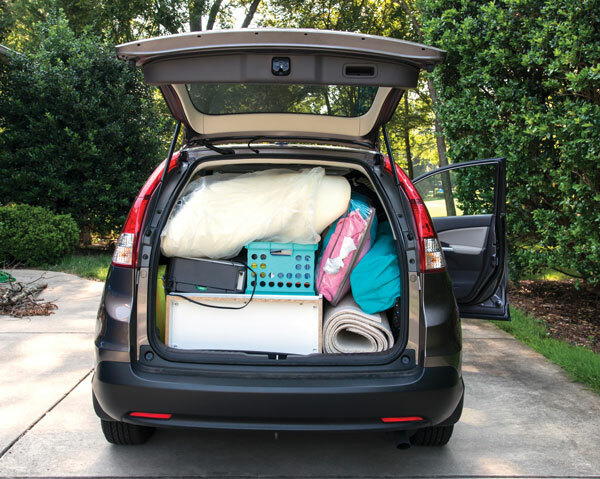 Many college freshmen are living away from home for the first time, and they’re often sharing a room with another student. Deciding what to bring and how to make that new living space feel like home can be challenging. Terra Peckskamp, director of the Office of Residence Life at Syracuse University, has seen just about every possible freshman scenario in her 18 years on campus. She has learned that styles and preferences may change, but some basic strategies can ease that transition to dorm life. She and two current students and the parent of a current student shared their thoughts on how best to prepare. Austin Philleo of Fayetteville, a junior political science major at Le Moyne College, says he brought basics, such as bedding, from home and tried not to bring items that had to be stored. Lauren Cussen of Clay, a fifth-year biomedical engineering student at the Rochester Institute of Technology, initially brought too much. “I wish that I hadn’t brought every pair of shoes and every clothing item that I owned because there just isn’t enough room to store it all and I only ever wore five outfits,” she says. However, she adds, students should not leave home without a good pair of boots and a pair of shower shoes. Turtschin encouraged her son to think about instances when he might be too busy or just did not want to go out to the dining hall. “I also used Amazon Prime and Prime Pantry to get him stuff quickly,” she says. 2. Share when possible. Microwaves, mini-refrigerators, and cleaning products are items that Cussen suggests can be easily shared with a roommate. “And maybe even a television if you have the same interest in shows,” she says. Philleo uses a laptop to watch movies and shows. And Peckskamp says campus-housing administrators across the country have noticed the trend and are evaluating whether they even need to offer cable service anymore. Lofting dorm beds to make better use of space has been a trend for many years. “It’s still popular. The university used to provide cinder blocks, but now retailers make sturdy, plastic ones in kits,” Peckskamp says. Cussen says LED mini-lights and wall tapestries are often used by students to liven up boring walls. 4. Bring a bit of “home.” No matter how far students are from home, having something personal with them can make the adjustment easier. “I brought some pictures of my family and pets, blankets, and even my own desk chair so I wasn’t using the generic college dorm chair,” says Cussen. Electronic devices have made it easier than ever for students to bring personal photos with them to campus, but other requests are more difficult to manage. 5. Be open to change. If there is one benefit to seeing college-bound students leave the nest, it might be seeing them develop important coping skills—tolerance, negotiation and basic housekeeping among them. But some lessons don’t come easy. Living in close quarters, conflicts are bound to arise. Peckskamp says managing them is best left to the students themselves and the housing staff at their schools. At SU, resident advisers help students negotiate agreements to encourage peaceful coexistence. Other issues, such as time management and housecleaning, often fall in line with the students’ personal needs.